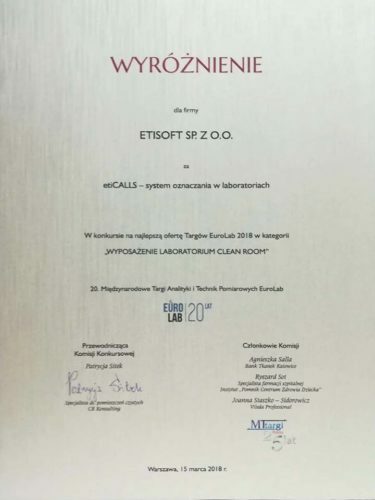 We are pleased to inform that during this year’s EuroLAB fair trade the EtiCALLS system was awarded in the category: “Laboratory Equipment – Clean Room”. Thank you to the fair organizers and experts who appreciated our solution. Previous PostPrevious post New release of etiCALLS at Analytica Fair Trade! Next PostNext post Optimization thanks to etiCALLS – welcome to the conferences!